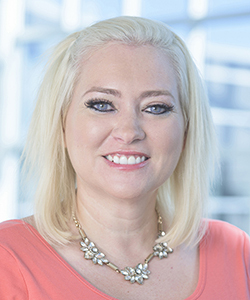 Dr. Megan Nickels is an Assistant Professor of STEM Education in the College of Community Innovation and Education at the University of Central Florida and an alumna of Illinois State University where she received her Ph.D. in mathematics education. Dr. Nickels researches how children with critical and terminal illnesses (cancer, HIV/AIDS, sickle-cell disease, etc.) learn mathematics through the use of educational robotics and immersive virtual reality. She conducts her research using Wonder Workshop’s Dash and Dot robots, the Lego Mindstorms EV3 robotics kits, and the HTC Vive virtual reality system. Dr. Nickels’ research has been supported in part by $1.25+ million dollars from NASA and the Elizabeth Morse Genius Foundation. Nickels, M. (2014). Meaningful measurement: Addressing equity through STEM. Wisconsin Teacher of Mathematics, 66(1), 8-12. Campbell, L. O., & Nickels, M. (in press). A guide for first year teachers: Developing gender inclusivity in STEM. The New Teacher Advocate. STEM Satellites: A Mobile Mathematics and Science Initiative for Orlando Metropolitan Area Children’s Hospitals: NASA CP4SMPVC+. (2016-2021). NASA. Nickels, M. (PI) & Bush, S. B. (Co-PI 2017-2021). $1,250,000. STEM-H and the Urban Robotics Project. Elizabeth Morse Genius Foundation. Nickels, M. & Sung. S. (PIs). $100,000. Learning and Teaching Computer Science for K-12 Pre-Service Teachers: Tech Fee. University of Central Florida. Nickels, M. (PI). $41,249.79. Transdisciplinary STEM Education for Graduate Student and University Partnership Recruitment and Engagement. (2017-2018). Faculty COACHE Innovation Award, Office of Faculty Excellence. University of Central Florida. Nickels, M. L. & Bush, S. B. (PIs). $10,000 . Engaging Pre-service and Practicing Teachers in Interactive Technology using ActivTables: Tech Fee. University of Central Florida. Nickels, M. (PI). $32,000.